The famous drink of Valencia: Agua de Valencia. This drink was introduced in 1959 by Constante Gil who worked in Valencia at the bar: Café Madrid. A group of Basque travellers challenged the bartender to make something new with cava. When the barman came up with this delicious treat, it eventually became a tradition to order Agua de Valencia for the Basque travellers. 11 years later in 1970 the drink became more and more known to others. 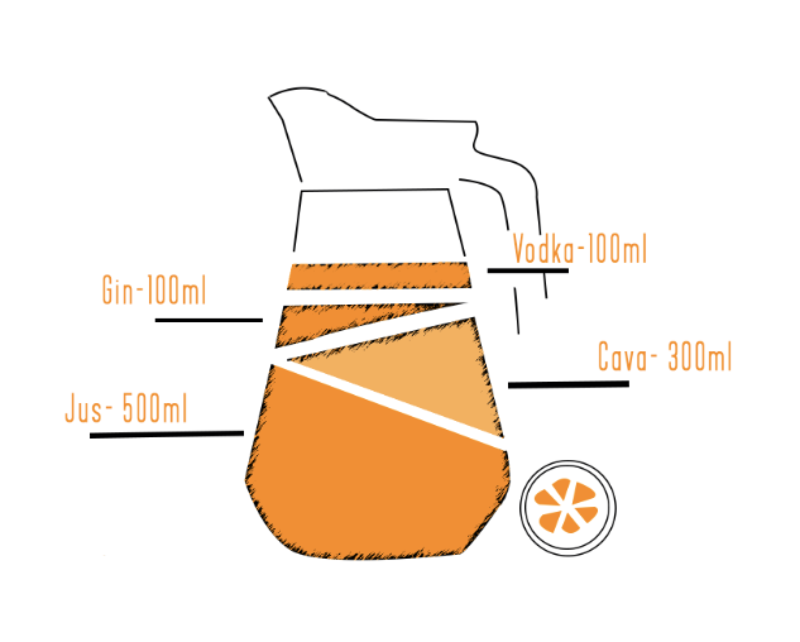 To make the cocktail so delicious as possible, it is best to use fresh orange juice. It could also be nice to add sugar to the Agua de Valencia, but this is not necessarily important. If you are on a leash or not really a fan of sugar, you can leave it out! First of all, it is important that you have 500 ml of fresh orange juice. Do you still need to squeeze them? Do that first! If you bought it from the shop, you can put 500 ml in a measuring cup and pour it into a large can. Then as follows add 300 ml of cava. Then you need to add 100 ml gin plus 100 ml vodka. As you read, there are quite a few layers of alcohol in this drink but you don’t really taste that because of the orange juice. So watch out because this can be very treacherous! The proportions of a can Agua de Valencia. If you want to add a bit of sugar to the Agua de Valencia, do this first! Even before the fresh juice. If not, the cava could froth. Are you planning to go to Valencia or are you going to Valencia soon? Then we recommend you to go to a terrace in Valencia to go and drink Agua de Valencia on the terrace. With the sun in your face and the typical Spanish drink you can enjoy your holiday to the fullest! Previous ArticleModern art museums in Spain you need to see!